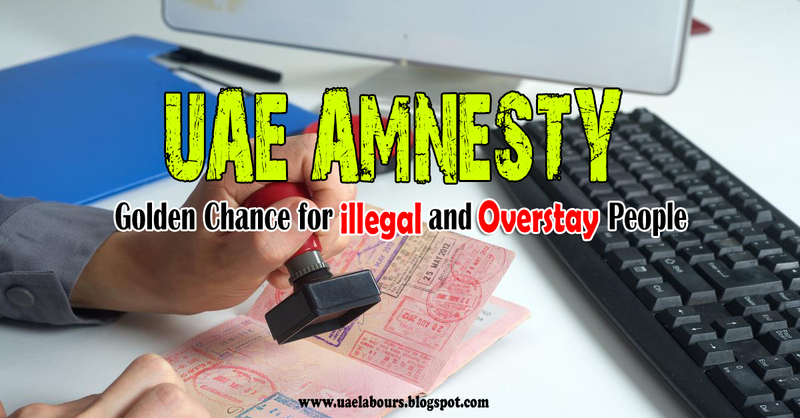 Amnesty in UAE for overstay and illegal residents is the biggest and happiest news of the year so far, after UAE Cabinet and leaders announce the new visa regulations everybody is wondering if/how they can get advantage of it. We have already covered the news Rules and Major UAE Visa Changes in below Article, if you have not yet fully aware of New UAE Visa Rules for 2018 and 2019, just click below image. UAE Amnesty or UAE Leniency will be our target for today informative guide. 1: What is the date of UAE Amnesty for 2018? 2: Who can take advantage from New UAE Visa Rules? 3: Who can get Overstay fine exemptions? 4: Can someone leave UAE Without paying fines? 5: Can someone face ban while applying for Amnesty? 6: Will someone get Immigration Ban? 7: Can I re-enter UAE after amnesty? 8: What will be Amnesty options, will be must leave UAE or we can stay? The FAIC, Federal Authority for Identity and Citizenship is going to grant a grace period for residency visa violators who are illegally residing in the UAE. UAE Government helped its residents several times, this time a big relief from UAE Cabinet passed which cover simple and straightforward rules especially on overstaying which will encourage expats who are illegally staying across United Arab Emirates to take advantage of upcoming 3 months Amnesty period to amend their visa status from illegal to legal. What is the date of UAE Amnesty for 2018? The new facilitated process for people overstaying their visa’s effective for 3 months starting 1 August 2018 to 31 October 2018.
Who can take advantage from New UAE Visa Rules? Each and every person who is living in UAE illegally can take advantage of new visa rules for UAE, as we know most of those who are overstaying here are going through torturous nights due to uncertainty of their future hence It is a very good and big news for them, point to be noted that those with police cases may not get amnesty exemption but it is not yet confirmed as some more options on the new decision for people who are overstaying have yet to be released. Who can get Overstay fine exemptions? Those who have overstayed in UAE and are going to leave UAE voluntarily can get overstay exemption, as we clear above those with police cases are not included. Can someone leave UAE Without paying fines? Yes, people who are overstaying in any part of UAE are given options to leave country without fines which will begin from 1st August till 31st October 2018. In more details, if you are a violator and living in UAE illegally, you will have 2 options, either rectify and change your visa status or leave country voluntarily without having to suffer any legal penalties along with waiving overstay fines that they may have due to their illegal stay in the country. This is also confirmed by UAE Number 1 News Website "Gulf News", screenshot from their website is attached below for your reference. Can someone face ban while applying for Amnesty? We are taking about Immigration and Labour Ban here, if you’re paying for your own ticket, you will not get a ban. Also, if you have entered UAE illegally and leave the country voluntarily within 3 months amnesty or leniency period, you will not get the ‘no entry’ stamp on your passport which will also valid for next 2 years. Will someone get Immigration Ban? No, if you’re paying for your own ticket, you will not get a ban. What will be Amnesty options, will we must leave UAE or we can stay? 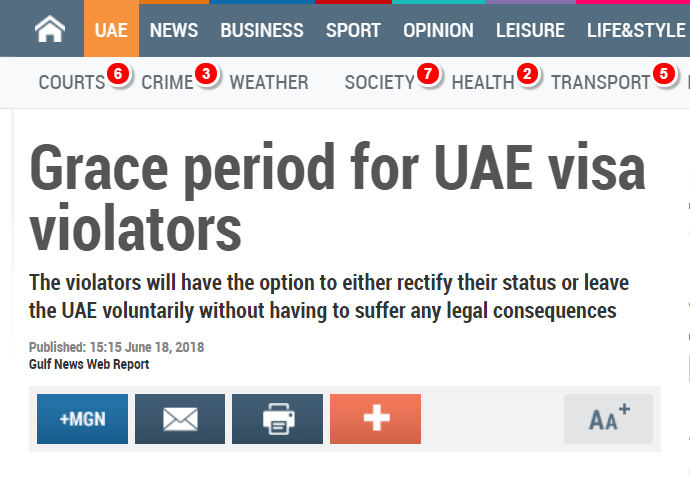 The violators will have the option to either rectify their status, or to leave the UAE voluntarily without having to suffer any legal consequences, along with waiving any fines that they may have due to their illegal stay. Can I re-enter UAE after amnesty? If you have not given Immigration ban, you can enter UAE anytime, also point to be noted that if you are a jobseeker and overstaying in UAE, a 6 months visa has been introduced for you, so if you wish to work in UAE without leaving the country, you can. And yes, it is true because the UAE Cabinet will allow individuals wishing to adjust or renew their visas to do so for a fee, without having to leave (In-Out) the country. please Don't Just Read, Share this Important and Informative News with all of your colleagues, Friends and Family Members, Thousands of expats were waiting for Amnesty by UAE Government, as they want to live legal, to travel their home countries to live with their love ones, so, don't leave this page without sharing, as sharing is caring. This should be check in Immigration system, the most possible reason is not completing contract periods. Sir i nid ur help about my case .i went to ksa yr 1997 working as a dometic helper.until my employer transfer me as a cleaner in a military hospital in his own company.in short i get pregnant with my bf he is filipino like me.in short we go to jail for 3 months and get deported.2006 i went here in dubai as a domestic helper again .everything is going well bcz i have a verygood employer.2014 i go for emergency vacation bcz my father died.aftre 1 month i came back to uae that time i got hold in immigration for deportation but my employer get me earlier before i get deported.and now they are kip on processingmy case but 4 yrs since 2014-2018 stil on the process.now sir i just want to know if i can avail the amnesty and fix my documents tobe a legal worker here in uae sir.so i can be prepared if what im gonna do so i can go back to my countryand comeback to my employer here in uae.pls answer and thank u smch.God bless. Sir those who took last amnesty can return to uae? Now im in india... i born in uae but didnt have visa for so many years thats why i took amnesty2013..
i already liked your page you are really doing a great job sir may allah give u khair in duniya and here after.... jazakallah khair.. This Reply is more than a gift, thank you so much for your kind words, May Allah (swt) accept our dua’s. I went in an Awir immigration and they sended to my country 7 march 2017 with lifetime ban. I don't have complaint from my sponsor and company. Company is close from 2 years. And don't any crime record in Dubai also no overstay. I want apply for the remove ban. What is solution? Plz reply me as soon as possible. Who told you to go to Aweer police station? In case if Company is not legal in Documents, for sure Immigration will ban you because you do not have right to live with visa in UAE, the mistake our people do is to visit Immigration offices and after visit they cannot guide officials, what you people need to do before visiting any Immigration Department, search for new sponsor, search for job, search for new visa, if someone can provide you visa, take him (sponsor) to Immigration with you to speak with them that we are going to process his/her visa, just pay overstay fine and get new visa, this is the process, feeling sorry for you Atif. Last 2012 i have a life time ban in sharjah imigration i ask them why i have ban he said im not leaving in uae in 12 uae in 12 years in this 12 years i have working visa in my company and 3 times i can get a vacation in the philipines and2012 dubai imigration hold me he said i have a case my case is not leaving in uae in 12 long time years that why im life time ban.now how can be open my case again to remove my ban ferdinand del rosario from philippines? You need to seek help of your previous employer in 2012, he or your representative can visit Immigration Department for you. Are you talking about amnesty? Maybe Sir. Would that be possible ? 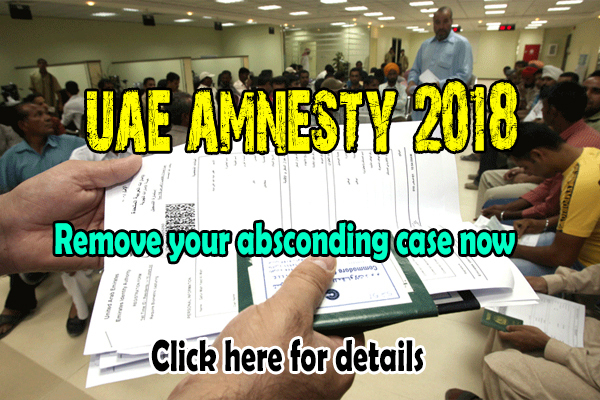 Yes, it is possible but only if your precious emplyer take back the absconding case, to check more about absconders we have updated new article on “who can apply for UAE amnesty 2018? Please wait as more updates are yet to come with places list and required documents details. What is the process/step on this if overstay person want to leave at 1 Aug. Buy air ticket and direct going to airport? No, wait till 1 August, you will have to prepare some papers and need to visit designated place, later once you’re Documents are submitted, officals will told you to show them ticket. They will attach your ticket proof in your file for future reference. Apply for amnesty on 1 August to rectify your status, more details on how to apply for amnesty with list of required documents will be shared with all of our readers soon, so please be calm and visit us on daily basis to check latest posts. Dear Sir I was in UAE on Visit Visa and I was overstayed there.My Travel Agency send me home.The date was 7 March 2016.I dont have any criminal record over there.Can i apply my visit visa again??? If you have paid overstay fines, then you need to check with any travel agency to apply visa for you, if it get approved, you will need to check your luck on Airport, if airport authorities allowed you to enter then you can apply for residency by getting job. Are you in UAE? If you are inside UAE then maybe you can avail this chance otherwise if you are outside country and absconded, then NO. So what might be the problem if the work permit is always rejected. As my employer told me theyndont even know why? For sure it will be Immigration Departments, but so far, there is no such list provided, please wait as more updates is yet to come. Sir what if I have 1month old baby .is it possible that we can join the amnesty by October without paying fines ? If you are still in UAE, its good news for you that you can avail amnesty 2018 which is starting August 1, more updates are coming soon with the details on what are the requirements or required documents to apply for amnesty, please keep in touch with us. And yes, your Ban will automatically be removed, if its is government sectors or freezone comapny, it will be more good, but if it is private company, you still can avail amnesty. Hello sir, this august 13 is my last day ofnmy extension day here in uae after august 13 i will be illegal and i have one year labour ban..can i avail for the amnesty sir? And no need to exit the country? Hello did you process your 1 year ban?its your ban lifted already?i Just want to know only because i have friend the same case..
Sir..is with absconding case can be covered by the upcoming amnesty? I've been overstaying for 8 years with an expired passport because of the absconding case..what is the best thing to do..thank you very much. My husband's previous employer filed absconding case against him since he did not exit the country on January 2017. his passport is not with him. Is he covered in this coming amnesty? Hi Sir Gud day! I am overstayed 13months from housemaid visa but already cancelled im not run away the thing is after grace period I ddnt find new sponsor and start living without visa. April 3 police catch me by checking ids and I stay in barsha jail 5days after done my judgement and judge told me I have fine 1,000 aed only and equevalent to stay in Aweer for 10days. And when the police in barsha making my release paper going to Aweer I ask the police if I still can comeback to UAE and she said yes just after 2-6months. And feel happy when I heard that words I'm just in positive thinking. So I finish my judgment in Aweer jail including days papers processing for deportation and the day came May 6 my deportation day. That's my story sir.in my 10yrs stay in Dubai in one mistake living without visa. It is true that I can comeback after 3-6months? I can enter again in Dubai? Please help me if it's true or no and there's a saying if I want to comeback anytime I have to ask or pay to delete or to lift my Ban? Please answer me sir. Thank you. Feeling sorry for you, can you please specify the year you deported? You need to check this with Immigration as we are not sure what type of ban you are facing, you can do this by online chat with Immigration staff or through your representative here in UAE by visiting IMMIGRATION Head office with your passport, visa and exit papers. How can you apply for the amnesty and when leaving for your country,wont immigration cease your luggage? What are the requirements of amnesty 2018? Hi! I just want to ask a question, my son's visa is currently on process under my sponsorship, however his visit visa is already expired and he has already overstayed for almost a month now. After we get the approval of his residence visa, will the immigration waive the penalty he incurred for his overstay? we have replied you on Who can apply for UAE Amnesty 2018? Ry after 14 days of the finishing of month .So that I want to go our country I have done the contract 19 Mar2018 .so can u tell me that I m eligible for alnesam 2018 and please tell me the centre address thank you. Thank you for your time to comment on our blog, we have not get your point, can you please clarify what is alnesam 2018? Are you talking about Amnesty 2018? What are the required documents to apply for amnesty? Sir,My visa expire on 22/05/2018.my grace period too finish.my labor cancel but my immigration not cancel coz I company give me immigration PRO card Ajmam company it's cars too expire from 12 months it's have fine 3900 hundreds when I apply Cancel my immigration visa this fine show.my company owner black list in UAE.This amnesty forgive me my PRO card fine or not? I am labor I have no memory for paying.What I do.How solve my this problem.plz tell me. Sir,My visa expire on 22/05/2018.my grace period too finish.my labor cancel but my immigration not cancel coz company give me immigration PRO card Ajmam company it's cars too expire from 12 months it's have fine 3900 hundreds.My visa other company Abu Dhabi. when I apply Cancel my immigration visa this fine show.my company owner black list in UAE.This amnesty forgive me my PRO card fine or not? I am labor I have no memory for paying.What I do.How solve my this problem.plz tell me. How to apply for amnesty 2018? What are the required documents to apply amnesty 2018? Sir I am a housemaid and I run away from my employer last October 2017 ,I just want to know if I can avail the amnesty because I just want to go back to my country. Most of my friends also have this case so we want to know the process. Thank you. Their is no confirm news for Runaway or absconders so far, but you people can surrender to Immigration anytime, for more details about runaway cases, please wait till next release from Ministry, we will update it soon. Hi. If I have outpass can i just go outside uae and return as visit visa? And how to remove labour banned for 1 year by this amnesty? No, people who are facing life time ban cannot enter UAE untill they got clearance letter from Immigration. Dear sir, How to get clearance paper from the immigration? Because i was in India. Is their any possible to get immigration clearance without enter Dubai. Dear sir, How to get clearance paper from the immigration? Because i was in India. Is their any possible to get immigration clearance without enter Dubai. Now i am in India. No, people who took last amnesty with runaway or overstay cases can not enter UAE on employment visa untill they got Clearance letter from Immigration. Will labour ban also be removed during amnesty? read our new article “who can apply for amnesty 2018? will a ban be given if the UAE gov’t pays for the ticket? After being terminated by the Cie on October 2017, overstay for 5 months in Dubai, the Cie put a case against me as i ranaway, can the ban be lifted with the amnesty? 3 years and half working for the Cie. I ve been terminated on oct 2017. For financial reason i ve been overstaying in Dubai for 5 months. When i went to take back my passport at the Cie on April, the Cie put a case as i runaway only on April. Can the ban be lifted with the amnesty? Thank you by advance for your answer . hi i have two daughters 14 and 8 who are overstaying here since 2016 because our application for sponsorship were denied and dont have money to pay for the penalties, can my daughter apply for amnesty so they can go home for good. Appreciate your answer. Thanks in advance. I started overstaying from may 8. And the job i got told me to exit use so They can process my employment visa, i want to ask,do i have to exit during the amnesty period or just amend my visa status. And again what are the documents required for this process? Hello i need some information , i entered UAE without visa Illegal , i have valid passport and another country visa , like Georgia . My nationally is Pakistani. Hi I want to ask regarding grace period. My visa expiration was 16th May 2018, my employer only make the cancellation 23rd June 2018. In my cancellation paper it is mentioned that I have to leave the UAE 0 days, will this means that i don't have nay grace period to take after being officially cancelled? One more is that i wasn't able to make an exit due to my passport is below 6months, so my new passport will only come after 1 month. My doubt is, am I already starting my days with penalties? I worked before as a housemaid in an Arab but unfortunately i was not able to finish it. I worked 8 months and I runaway I checked my status in immigration and I find out I have a ban. I tried to removed my ban,me and my employer went to immigration to removed it but immigration said he cannot remove it because its already more than 2 years. That time I found an employer that will give me visa.pls advise me what to do or can I avail this amnesty. Thanks and god bless. Hello po pa tulong nmn Kung ano pwdi gawin..
hi, i have friend, have overstayed since july 15 and now he dont have money and he has previous one month visa only, is he qualified for the amnesty? Good day, we have 3 employees in our company until now not renew their visa and still they are working with us. It is possible the company can avail this amnesty? i mean we will renew their visa and avoid the fine? Hello sir, my friend is in Abu Dhabi jail for 2 months now waiting for deportation for absconding case opened by previous employer where she finished contract and visa duly cancelled, but new employer did not process her new visa in correct time so case was opened. Will she be allowed to avail of the UAE Amnesty 2018? With the amnesty, will her case be removed and then can she stay in UAE to find new sponsor/employer without going back to home country? What is the procedure to apply for amnesty? Can you please tell me how long you need to wait to get amnesty? And also if you are having a abscond is it possible to get amnesty? This is for both (residence and visit visa). Also do you have information where we need to go to submit documents for amnesty? Thank you so much for your replay! now i need to change that guarantee to another person from me. I am terminated from my job last December 2017, and i got a 1 year labour ban. I just want to ask if it can be lifted during amnesty period? good morning sir, how about my daughter is born here in the uae then how many times i applied her visa in the immigrations but was rejected, because they said about for our profession im a chef and my wife manager in FNB so i tried how many times but same rejected so until now she have 4 months overstay and now given amnesty we will go exit to philippines then possible she can return in uae together with us with no issue in the immigrations, so can avail her for 6 months visa...please help me so!! thank you so much and godbless..
6 months visa is for job seekers only. Maybe get her 3 months visit visa now while still here in UAE or when coming back to UAE from Phils. Then just renew every time expiry without need to exit by paying small renewal fee only. I know one maid who had to leave her current employer due to medical reasons but the employer put an Absconding case against her while she was in the country. She is still in the UAE illegally and her old employer is not entertaining any calls to lift her absconding status. Is she eligible to rectify her Residence Status with a new employer during the Amnesty period and her Absconding status in the system will be cleared? Yes, she can remove her absconding case by paying 500 AED Fees, but first confirm from new sponsor, if he is ready to give her new visa. Sir, i had a case in the court for more than a year..i won the case and i had the court decision in favor of me. I worked with ny previous company for almost 4 years u der unlimited contract. Into my surprise, when i approach labour to cancel my labour card, it appeared that i have a labour ban, hence my new company cannot apply fo my visa.. how can i rectify thia sir? Is this something that can be lifetd with upcoming amnesty program? My new company is very willing to employ me but because of the labour ban, they cannot apply.. is my labour ban something that can be rectified by this ambesty sir? By the way i am already cancelled in the immigration..my only problem now is my labour ban.. Please help me with this concern. Thank you..
Hi Good day Sir...i have a friend who wants to avail of the Amnesty 2018 due to overstaying...but she is not sure if she still have some outstanding police case/s that might hinder her chance to change her visa status due to credit cards or loan though she cleared them before..From whom, where & how can she check if she has some police cases..if there is, does she need to clear them first so that she can smoothly avail of this upcoming Amnesty period in which her principal wish is to rectify her status, stay legally in UAE and get a decent job to rebuild a new life...Your kind info & help is greatly appreciated...Thank you..God Bless! I have a life time entry ban. How to get clearance paper from immigration? Now i am in India. Please guide me sir. Anyways if this is as per the new amnesty relaxation then will inform her to get it done ASAP..
Hello sir,my visa will be finished this august 13 as my extension from the cancellation after august 13 i will be illegal already and i have one year labour ban can i avail the amnesty sir? sir my husband is working in uae but he's boss doeasnt processed the visa.. he is visit visa now he is over stay can he get amnesty?? Hello, one of my friend's company has imposed a Ban on him for not completing a limited Labor contract. He has served his notice period and paid for the remaining day still they have imposed a Ban on him. He is an HSE Engineer with attested degree. Does his situation covers under this new System. Can he lift his Ban by showing his new offer letter to the immigration? Sir I want to know one my friend lost his passport and overstay also the valid date of passport expired. How to apply for this ? Also how to apply ? Is it any special counter had open? but the company did not cancel me so I took the problem to labour from labour the case was fWded to court cuz at each summon my boss never showed up,so finally the judgement was given and he is to pay my benefits and the rest. But my problem is I took the judgment being given to me from court to labour for my cancellation but I was redirected to immigration and from there, they told me I have to pay an overstay fine, in this situation am I the one to pay for the overstay or my boss and how will amnesty handle this? Thank you so much for taking the time to answer all of our questions and spending your valuable time helping us we really appreciate that and I ask to allah to give you khair in return I have a question my Visa sponsored my husband but we divorced and he cancelled my Visa but for some reason I didn't leave the country and have overstaying fine, now I want to apply amnesty I got a job offer from a company and I want to get the 6month visa I want to know the procedures what I have to do should I go straight to the Sharjah immigration or please I want to know step by step I would be so appreciated if you could take the time to read and answer me, may Allah reward you all of you and guide you to jannah inshallah. Hi sir i have ban from ministry of labour i got the job in new company they apply my new visa and visa is rejected due to labour ban because I worked my previous company only 2 months . I confirmed my previous company they didn’t immpose ban on me the ban is authenticity immpose on me from labour .. so please tell me there is any possibility i go for amnesty in al aweer . Hi sir,I came back in 2015 amnesty I have absconding case which I settled with sponsor but I didn't left stayed 2 years cause have to clear my debts in amnesty I have no "noentry" stamp and no ban.can I come again to dubai and take new job.thx. Two years before i was overstay for one year in Dubai. I went to avir imigration they took my finger prints and send me to my home country. I had no case. How can i check my status.?. Can i re enter UAE. I would like to ask if i can avail the 6 months tomporary visa. My previous company cancel me in labour but they didnt cancel me in imigration. I just got my passport from them with the help of police officer bringing the paper from court. Hoping and will be waiting for your reponds. Thank you and have a nice day ahead. Hi, It will be great if you update location map of immigration office shahama here. My names is Jessica Jack i want to testify about the great spell caster called Dr Purity my husband and i have been married for 4 years and 7 month now and we don't have a child and the doctor told us i can't give birth because my womb have been damaged due to wrong drugs prescription this got me so worried and my husband was not happy so he decided to get married to another girl and divorce me i was so sad i told my friend about it she told me about a powerful spell caster she gave me his email address well i never believe in it that much though i just decided to give him a try and he told me it will take 24hours to get my husband back to me and i will get pregnant i doubted him the 3rd day my husband came back to me and was crying he said he didn't want the divorce anymore 3 weeks after, the doctor confirmed that i was pregnant. He can also help you no matter what is the problem there is a solution and indeed you we be the next to testifier contact him at: puritylovespell@gmail.com or Whats-App him on this number:+2348070980389. Sir my visa expired on 11 aug 2018 can i apply for job seekers visa plz reply me??????????? My entry uae illigle. I don't have any visa. But I want to stay in uae. Have any options for getting visa 6 month visa for me.or any liglle solution without exit uae. Hi. If i got the out pass from amnesty can i travel and return back with visit visa? And if i got labour banned for one year can it be remove by the amnesty now? Hi Sir! My Visit Visa will expire on August 28, 2018. Can I apply for amnesty after it expires? Or they just give amnesty for overstayers before the amnesty period? Only for overstay by July 31 only. I think uae labours is busy answering questions.but here is my view,If he exited then no absconding shall impose,as long as his new employer make his new visa and make sure that transfer of sponsorship is issued to make it legal.i hope this one help.transfer of sponsorship is big issue nowadays, the employee is the victim, and the reason for absconding and blacklisted to uae. Wake up people!!! Hi sir my friend can not find her passport untill now in all the immigration she asked but not availble there. Maybe immigration already forwarded to her embassy. Check there. How to Save Your Marriage And Get Your EX Lover Back Fast After Breakup/Divorce Even If Your Situation Seems Hopeless!Contact: Unityspelltemple@gmail.com Is Certainly The Best Spell Caster Online And His Result Is 100% Guarantee. Me Visa (visit) will end this September and will be over stay because I dont have money anymore. Is it possible for me to get Amnesty? why no? amnesty is for every one overstayed right? Only for those who overstayed before Aug 1, 2018. Two days passed, my visa has not been canceled. Overstay after Aug 1 is not covered by Amnesty. No you cannot get 6 months temporary visa because overstay happened after 01 August 2018. But you may pay the fine of around Aed 100/day if your expired visa was a tourist or visit visa, exit UAE then get new visit visa so you can come back immediately. Can someone apply the 6month visa if they ocerstayedfor more than a year??? Yes if overstay happened before 01 August 2018. Yes can avail if runaway happened before 01 August 2018. He may come back after the ban period is over like 1 year after his deportation. Just apply for new tourist or visit. But if it is lifetime ban then he cannot come back because it cannot be removed. You can find out how long is his ban period by consulting in GDRFA (Immigration ministry). Unfortunately, overstay after Aug 1 is not entitled to avail amnesty. And fine is Aed100/day so the longer she stays, the bigger the fine. I suggest she pay the fine as soon as possible, exit UAE to nearby country like Oman and get a new visit/tourist visa to be able to come back and continue searching for job. Any travel agency can process this for her. You can go directly to Al aweer immigration to avail amnesty so you can get exit pass. Your fines will be waived off. Just bring your valid passport and old visa or old Emirates ID. You are eligible to avail amnesty and apply for 6 months temporary visa in any Tasheel branch. First get your passport which they may have forwarded to your embassy by now and present it at the Tasheel together with old visa. They will remove your absconding case and fines and submit your new visa application. Pay the typing fee and come back after 2-3 days to collect your new visa. You can go to Al aweer immigration to avail amnesty so you can get exit pass. Your fines will be waived off. Just bring your valid passport and old visa or old Emirates ID. My visit visa is expired sinced september 10, 2018 NOw I am overstaying and cannot pay fines and exit A to A for another visit visa, but I have a Job offer. Can I avail the 6 months jobs seekers visa to continue working here since I have a Job offer. The main problem is financial. Do I need to pay fines for overstay? Overstay after 01 August 2018 is not entitled to avail amnesty including temporary visa. I suggest you accept the job offer, request your new employer to settle your fines, process work permit and residence visa, then deduct the amount of fines he paid from your salary on installment or partial payment basis over a period of a few months. Make sure he apply for your work permit within 1 week of signing your contract to avoid accumulating more fines everyday. My visa was issued from Fujairah. I have just renewed may passport from Bangladesh Embassy Dubai. Can I apply for a visa in a Dubai based private firm ? since Bangladesh employment visas are not being issued. please advise.